When someone in the crowd asked frontwoman Frances Quinlan why her band is called Hop Along she responded with, "It was a nickname I had in school because I always lagged behind." If Quinlan was once trailing her friends, she is definitely ahead of her musical peers now. The recently released Bark Your Head Off, Dog is Hop Along's third album as a full band, their most sonically dynamic work yet and one of the year's best releases. Led by Quinlan's candid narratives working like short vignettes for real-life characters and personal anecdotes, Hop Along brought their latest live show to a sold-out Horseshoe Tavern in Toronto last night (June 8). Opening with Bark Your Head Off, Dog's poppy lead single, "How Simple," Quinlan enlisted guitarist Joe Reinhart and touring member Chrissy Tashjian, along with most of the audience, on the gang vocals for the catchy chorus ("Don't worry we will both find out, but not together"). Quinlan later retold an embarrassing interaction she had while serving in a restaurant on "Waitress," a standout from 2015's Painted Shut, concluding it with her signature gut-wrenching yowl, which was powerful and vulnerable at the same time. There's no doubt Quinlan's immensely flexible voice is the best part of Hop Along, and it was truly a treat to see her effortlessly nail each song with an uncanny ability to express shame, despair and joy with acute precision and awareness. The folksy introduction for "Look of Love" started out with Quinlan playing solo, showcasing her clean, smooth croons about feeling guilty about a hated neighbour's dog that got hit by a car. Quinlan looked back on her childhood again on the country-tinged "Horseshoe Crabs," in which she constantly peppered her tender delivery with healthy doses of raspy snarl. At the end of "Prior Things," Quinlan impressively used her strained, voice-cracking wail in such a way that it somehow remained quiet and coolly subdued. Quinlan is a singer with many tools up her sleeve, and she's an expert at finding the right voice to fit the essence of her songs' every line. The rest of the band was tight and controlled but still instinctively rich and colourful. "Somewhere a Judge" highlighted Reinhart's inventive, dexterous guitar work that complemented Quinlan's vocals all night. On the spiny "What the Writer Meant," Reinhart showed off his math-emo roots with extended guitar tapping riffs that were contradictory to the dusty tones from Quinlan's acoustic guitar. Mark Quinlan's (Frances' brother) enthusiasm for intricate, driving drum beats was evident on the vigorous "The Fox in Motion." Mark also provided some comic relief ("You guys ain't mild, you're wild!") during the show's technical difficulties — when a fan shouted for them to play "all their songs," Mark said, "I don't even know all our songs… I left my family for this!" Hop Along's encore was a trio of fan favourites that started with the graceful poignancy of "Well-Dressed" ("for anyone struggling with mental health right now") and the propulsive interrogation of "The Knock," which led into the frenzied, fist-pumping sing-along for "Tibetan Pop Stars" from 2012's Get Disowned. 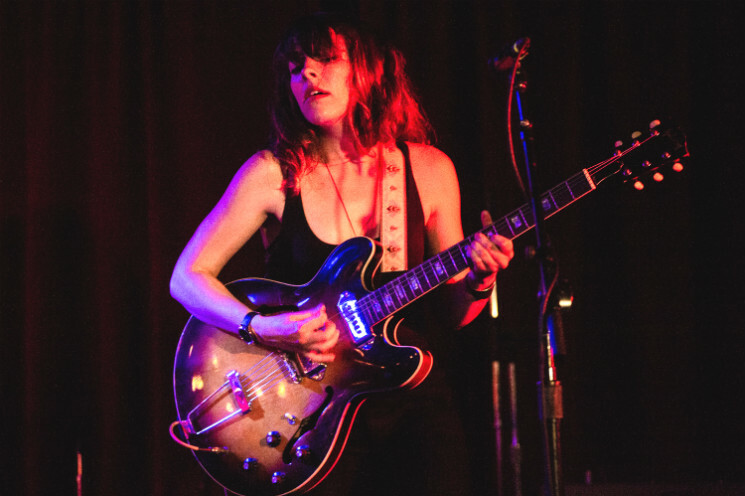 The band's tastefully complex blend of power-pop, emo and folk, along with Quinlan's literary stylings and vocal performance, made Hop Along a unique act to see live. It was thrilling for the enthused crowd to watch their unpredictability unfold wonderfully on stage.